Cut the stems from the beets, wash them and place the beets (with skin on) in a medium sauce pan. Cover the beets with water, and add salt. Bring the beets to a boil, turn down the heat and cover. Cooking time is about 40 - 45 minutes. Insert a knife into a beet to test if they are done. Remove the sauce pan to the sink, run cold water and lift the beets out one at a time to run under the cold water. Cut a slice off the top where it joined the stem. While the beet is under the cold water, take your fingers to start removing the skin. It will easily come off. When this is done, place the skinless beet in a clean dish. Continue this process with remaining beets. Slice the beets in the serving bowl, add about a cup of hot beet juice, a pinch of salt if needed, and Earth Balance or butter. Before serving, baste the beets with the warm beet juice. How to cook beet greens? Remove the stems at the point where they join the leaf. Discard the stems. Wash the beet leaves carefully and place in a colandar. In a medium size sauce pan add vegetable broth, chopped garlic, olive oil or butter and salt. Simmer the greens, turning them as they wilt. Cover with a lid for 2 or 3 minutes. 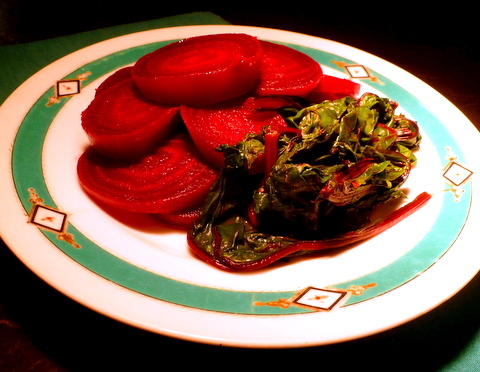 Serve the greens (with or without cooking juices) with the sliced fresh beets.